Sad to hear of Peters passing my sympathies to the family. I have a lot of memories of Peter both at school and later unfortunatly after leaving work in Leyland I didnt see much of him but he will be missed. R.I.P. I went to peter's remembrance and celebration at charnock richard crematorium on monday there was about 100 people attended the minister made a lovely presentation i think pete would have proud. R. I. P. peter we had some wonderfull days all those years ago. Anyone remember Mr Young's old Rolls Royce? I'm on that picture ! Yes, I recall mr Youngs car. I recienty discovered this site and I knew several of the names listed below the school photo. I left Leyland in the early 70's but visit occasionally. Is there anyone here that remembers me. 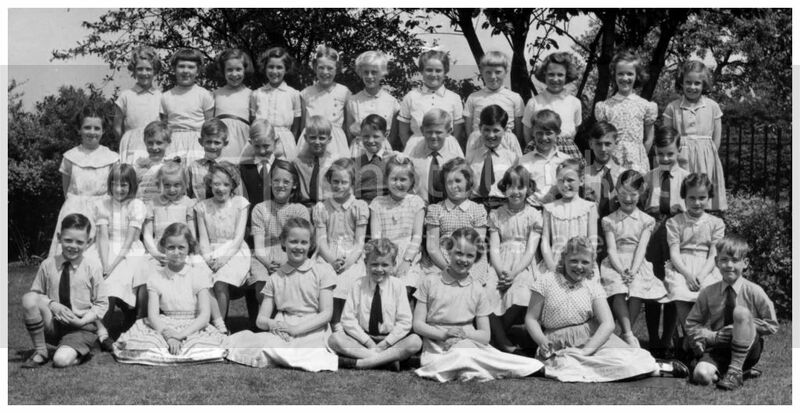 Although i'm not in this picture I can remember school class photos like this one being taken during the summer. I also know many of the names listed, so must have been attending Fox Lane school about the same time. Is there anyone out there who remembers me? I went to Fox Lane for the first 3 years. I passed the 11-plus exam while in 3rd form and skipped 4th to go to Balshaw's' starting (I think) in September 1952. I planned an engineering career and signed up for 6th form, with Pure Maths, Applied Maths and Physics as my three "signature" classes. Unfortunately, the Maths teacher was Mr. Wlkinson, who was so obsessed by the girls, I never got any help. I bailed out in April 1958 and got an apprenticeship with English Electric Aviation. First year at Blackpool Tech, I scored 100% in the Maths exam and went on to a Second Class Honours B.Sc. in Mechanical Engineering at RCAT- Salford. I went on to a career at Boeing, retiring in 1998 at 57 years old.